GE’s GIS retrofit solutions are designed to replace aging or obsolete circuit breakers manufactured by GE or a 3rd party with a new GE circuit breaker that includes the pure spring mechanism. The GIS retrofit solution is a cost effective and reliable method to modernize and extend the lifetime of the substation by gaining all the advantages of implementing new reliable technology. The solution is suitable to replace vertical or horizontal GIS circuit breakers. 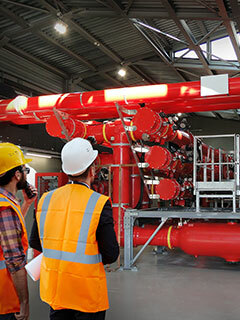 Installation, testing and commissioning of the new assets within the substation. GE’s solution is designed for 72.5-145 kV and 300 kV-420 kV gas-insulated substations, regardless of the manufacturer or the application. To match the existing configuration and dimensions, phase-distance can be adapted with the interface and the 420 kV circuit breaker can be installed in U or Z configuration.